SAROS is a designer and manufacturer of conventional and exceptional feature ceilings, metal structures and lighting solutions under SAROS DESIGN trademark. Stretch ceiling production facilities are equipped with the most up-to-date nesting and pattern cutting and welding equipment. A constant microclimate required for the process is maintained on the premises. There is a continuous output quality control at the place of production. Each stretch ceiling has a test card with a respective quality control check point note and a list of the employees manufactured that very sheet. Production resources and technical facilities are being continuously upgraded. The sheet nesting software developed by our company offers the possibility to manufacture stretch ceilings within the shortest time period and minimise production wastes. Stretch ceiling sheet packing that is thoroughly thought through to the finest detail makes sure that stretch ceilings are delivered to you in the best condition possible. Our experienced process engineers are continuously looking for new SAROS DESIGN stretch ceilings applications and can meet almost any challenge set for the production. SAROS DESIGN not only manufactures stretch ceilings but also designs, develops and manufactures various indoor light fixtures and lighting systems. We offer both a standard range of indoor light fixtures as seen in our INDOOR LIGHTING SOLUTIONS catalogue and the possibility to manufacture custom lighting solutions. 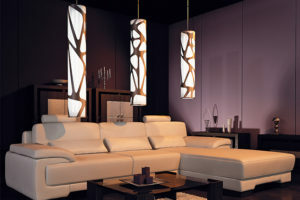 Carefully selected indoor lighting is the key to cosiness, psychological comfort and working efficiency. We can offer light fixtures both to lay emphasis on individual interior elements and to illuminate large confined spaces, and to illuminate working areas. You are welcome to cooperate with us in exclusive lighting projects and non-conventional lighting solutions implementation!